Disassembly is not always required, it really depends on what you are coating. If you are coating a piece of metal that is only made up of 1 part, then you can skip this step. If you plan on coating a part that has any rubber, plastic, gaskets, wiring, etc. involved, these pieces will need to be removed because they will likely melt in the baking process. Any bearings will also need to be removed, even if they are made completely of metal. Bearings are often packed with grease, that, when heated in the oven, will ooze out leaving the bearing useless or severely shorten its life. Magnets should also be removed as a lot of them will become demagnetized during the baking process. When disassembling anything before powder coating, just make sure that you will be able to properly assemble it when finished. Always do research on this before you even pick up a wrench. Anyone can unbolt two brackets and coat them, but taking apart a transmission to powder coat the housings is a little more difficult. Always take pictures and notes of the disassembly if you aren't an expert on how it goes back together. Even if you have an assembly that is entirely metal, but it is made up of multiple pieces, I often find that dissembling the part and coating each piece separately gives the best results. Some parts are more difficult to disassemble than others. While one part may be bolted together and can easily be taken apart, another part may use rivets, pins or other fasteners that need specialized tools to remove and replace. It is up to you how much you want to disassemble parts like these. After your part is disassembled, you will do a thorough cleaning of the part. 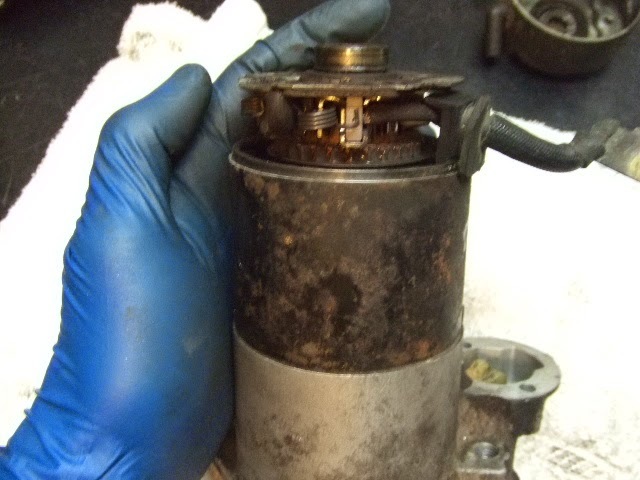 You will need to remove all dirt, oil, grease, and grime from the part. Your goal with this cleaning should be that you could sit it on your best white shirt when done without it leaving a stain. Do not worry about rust or paint at this point, that will be removed later. Sometimes cast metal items will be stained and no amount of cleaning will remove it, that will also be taken care of later. Definitely read this article which is a completely in-depth article on the cleaning step. A general degreaser can be used for this cleaning, just make sure it is safe for the part you are working with. For steel, I use and highly recommend Super Clean, formerly Castrol Super Clean. For aluminum, I use Simple Green Extreme, since it was specifically developed to be safe for aluminum. Along with the cleaners, I use an assortment of scrub brushes and an electric pressure washer on the larger parts. I chose an electric pressure washer simply because of the ease of use. This Sun Joe Electric Pressure Washer is very good as far as electric units go. After you given your part a thorough cleaning, you will then remove any previous coatings whether it be paint, powder coat, or anything else. If there are no previous coatings, you can skip this step. Depending on how much you powder coat, this step can be skipped, and any previous coatings can be removed by sandblasting. If you are powder coating a lot, I highly recommend a stripper, especially if the previous coating you are trying to remove is powder coat. Some previous coatings can be a nightmare to sandblast off and the stripping step is a great time saver. I have written an entire article on stripping coatings and it can be found here. At this point, your part should be as clean as you can get it and down to bare metal. This is when you would do the outgassing procedure. Not all parts need to be outgassed so this step is "optional". Cast iron or cast aluminum are porous and they can absorb oils during the manufacturing process or while they are in use. I always outgas all cast parts and any parts that have lived in a greasy environment. The outgassing procedure is the process of pre-baking the part in the oven at a higher temperature and longer time period than the actual powder coat curing. This pre-bake heats up the oils inside of the part and drives them out. You will often see a part smoking during this process, the smoke is a result of the oil burning up. If there are oils present inside of the part, and you do not outgas first, then these oils will come out during the powder coat curing which will leave little bubbles or bumps in the finish. There is no set standard for outgassing, different coaters follow different guidelines. Some will leave the part in the oven until it stops smoking. Some will leave it in for a set time. My procedure is to put the part in the oven at 440 Degrees F and I adjust the time based on the size of the part. A small part like this starter would go in the oven for 30 minutes. For wheels, I would leave them in for an hour or longer depending on if they are still smoking. My reason for 440 degrees F is simply because at around 500 Degrees F, some aluminum alloys can start to anneal, which causes them to lose their heat-treatment, and therefore their strength. 440 Degrees F seems to be low enough to stay far away from the annealing temperature, yet high enough that it will remove any oils that would come out during the powder coat curing. Again, there is no set procedure, this is just what I do, and it works for me. At this point, your part is ready for sandblasting. Sandblasting will clean your part to clean bare metal while providing a texture to the part which allows the powder coating to adhere to. When sandblasting, you will want to sandblast every single area of the part, completely, and thoroughly with clean media. There are some areas that should not be sandblasted, like brake caliper piston bores or cylinder bores. These areas need to be masked off prior to sandblasting. Do not use dirty or oily media to blast parts as you are prepping for powder coat. This oil will contaminate the part and you will see it in your finish. To see the full benefits of sandblasting and learn how to set yourself up for sandblasting, check out Media Blasting Part 1 and Media Blasting Part 2. 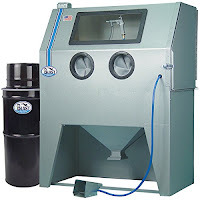 If after reading those articles and you are still too stubborn to set yourself up with some sandblasting equipment, then check out the Alternatives to Sandblasting. The end result to sandblasting should be completely clean, white metal with no contaminants at all. From this point on, your part should NOT be handled with bare hands. Use clean gloves only. I mentioned above the besides cleaning, sandblasting also leaves a texture on the part which allows powder coating to stick. This texture is responsible for the adhesion and therefore durability of the powder coating. Without it, powder coating can be chipped relatively easily. There are alternatives to sandblasting to achieve this adhesion called phosphate coatings. However, these phosphate coatings do not provide as much adhesion as sandblasting and the durability of the powder coating will not be as good. Many production powder coating facilities that coat thousands of parts per day will use a phosphate coating instead of sandblasting. Phosphate coatings are much faster to apply compared to sandblasting each part individually. Unfortunately, the durability of the powder coating suffers because of this. The coatings used area usually iron phosphate or zinc phosphate. Iron phosphate is commercially available from almost every powder retailer. You can see Powder 365 sells Iron Phosphate here. Zinc phosphate is superior to iron phosphate; however, it is much more controlled and you will need to setup an account with a chemical supplier in order to purchase it. For the absolute best adhesion and durability, you can use a phosphate coating in addition to sandblasting. Sandblasting will remove almost all contaminates from your part, however your part will come out covered in sandblasting dust. Once you remove the part from the cabinet (WITH CLEAN GLOVES) you can remove a majority of the dust by spraying it off with the air compressor. Make sure you are spraying it with clean air though, you will need to have a moisture removal filter in the air line, otherwise you can contaminate your clean part. If you want to learn how to get clean compressed air, check out this article. After a majority of the dust is removed, I will then scrub the part aggressively with a clean stiff bristled brush and blow it off with air again. Then I use denatured alcohol on a clean towel and gently clean/blot the part. 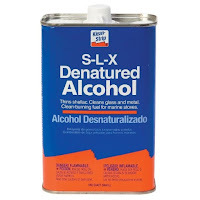 Denatured alcohol is strongly recommended over acetone. It leaves absolutely no residues. I try to leave as little lint as possible during this step. I then blow off the part again and go over the part quickly with my trusty propane hand torch which burns off any remaining lint and also causes any traces of denatured alcohol to evaporate. Masking is dependent on the part. Some parts require some masking before powder coating and this is the time to do it. I do all my masking with clean gloves on as it is the very last step before the part is powder coated and one sweaty finger print can show up in the finish. I do all of my masking on a clean workbench top with clean tools. If you would like to see some tips on masking, check out Masking Part 1 and Masking Part 2. The last step is to hang your part, I use an assortment of hooks of different sizes as well as bare wire to hang parts. Bigger parts get a bigger stronger hook. The last thing you want to hear after doing all this work is your part falling in the oven because the hook gave out. If you are powder coating your parts on a grounded rack, make sure the hook you are using is clean bare metal, so it is able to conduct the ground through to the part. Do I spray phosphate right after sand/media blasting or should it be applied after post-sand/media clean blasting? You would apply the phosphate after step 6 ( post-sandblast cleaning). That way you are applying the phosphate to a dust-free part. That is great to hear. Thanks for reading and also thanks for being an active member on the Powder Coating Group on Facebook. It is a moderately active and there are several very knowledgeable powder coaters that answer questions. There are some new guys too though that like to give out questionable advice but luckily either someone else or me can correct them. Thanks for the great information. I've been wanting to get some powder coating done in my basement, but I just wasn't sure where I should start. I'm just hoping that I'll be able to figure out what to do with your advice. Hopefully if everything goes as planned I'll have this done by the end of the month. I really hope to finish both of them this month. Sorry for the delay, thanks for being patient. I use an 18 ga satin coated material clean from the mill currently and finish spray enamal with great success, do you think I need to phosphate if the satin coat is clean and outgassed? I would prep it according to the spray enamel you are using. Usually it just calls for 400 grit sandpaper. Phosphating can add a little corrosion resistance, but when using what I am assuming is from a spray paint can, its really not going to work any wonders. Mainly, its there to provide some adhesion if you don't want to mechanically prep the part. Sandblasting would be best, followed by what the instructions say, followed by phosphating. However, adding phosphate to the first two would make for a better end product. I buy 6061 aluminum and machine it on my CNC milling machine. After that I clean the parts in Simple Green Extreme mixed with water. Let it sit for few minutes and then rinse in with clean water. Next I bake the parts for 20 minutes at 425F. Wait till they cool down and powder coat them. Place in oven for 20 minutes at 425F. After I remove them some parts (most of them) have a dots all over with bare aluminum showing. Why this is happening? Looks like when I powder coat a water drop get under the powder and while in oven it evaporates. It sounds like you need a post-outgassing cleaning process. Media blasting is usually done after outgassing which removes most contaminants and oxides. It also preps the surface of the aluminum for better powder coat adhesion. Without any media blasting, a freshly machined aluminum surface would be very smooth and the powder coating would likely chip very easily without any prep. Not related to your problem, but it is something to consider. 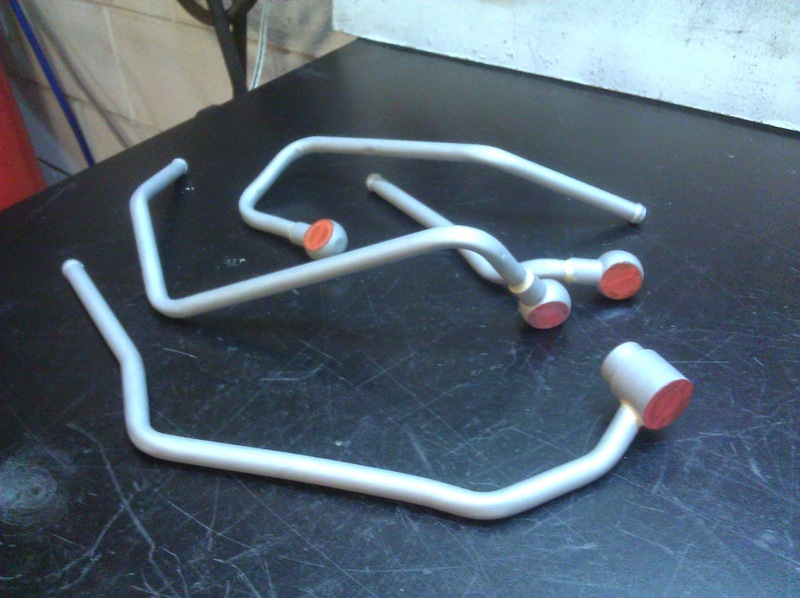 Also are you sure the air lines you are using for your powder coating gun are clean and free of oil/moisture? Does it happen with all powders or just one? I'm really sorry for late reply. We have to move to different location. This is happening only with one powder-black. It looks like it might be oil or water in the air system because I add a small filter right before the gun and now it works like a charm. Quick question...is it possible to Powder coat over another coat of powder coat? I sprayed suspension parts the wrong black and have sanded and Blasted alot of the 1st coat but wondering if I need to completely strip it all off. Thanks! While it is possible to powder coat over another coat of powder, in your situation, it would be best to strip it all off and start fresh. Generally powder coating may be regarded as an environmentally favoured method of applying a finish particularly as it avoids the use of solvent-based paints avoids overspray wastage, and any unused powder may be fully recycled and used again. Isopropyl alcohol should work as a replacement, however it does contain some percentage of water which may cause micro-rust on parts before powder coating. I did a little research and it seems that denatured alcohol has other names in other countries. In many countries, it is called Methylated spirits. According to your profile, you are located in Indonesia. I'm not familiar with the product, but a google search showed that there is a product available in Indonesia called Blue Spiritus which is methylated spirits which is supposedly denatured alcohol. That may or may not help, but I hope it does. Hello Sean - I am powder coating a large stainless steel cap for the top of an outdoor chimney. With regards to preheating parts, what temp and time limit do you recommend for baking off any contaminants after cleaning the part and without possibly warping the part? Thank you for your time. I generally outgas parts at 50 degrees higher than the powder cure schedule and for twice as long. For example, if a powder cures for 10 minutes at 400 degrees, I will outgas it as 450 degrees for 20 minutes or longer if the part is still smoking in the oven. Make sure to use an infrared thermometer to make sure the part is up to the required temp before starting the timer. This applies to both powder coat curing and outgassing. Keep in mind that outgassing only really needs to be done on items that are cast aluminum, cast iron, magnesium, etc, items that have spent a long time in a greasy/oily environment, or items that have been exposed to salts. Just a side note, if the part is aluminum, I usually only outgas it at around 430 degrees F max. Just to avoid any possible annealing of the aluminum. In this case, it would be best to do a coat of zinc-rich primer before doing your color coat. This will add an additional layer of protection and the zinc in the primer will also help prevent rust from forming. The most important thing is that you get complete and full coverage and that you immediately coat your part after you finish blasting and prepping. Rust can form in a couple of hours in a part that has a heavy cast finish so coat immediately. If you don't want to wait around for the zinc-rich primer to ship to you, you can do 2 coats of whatever you are trying to coat it with. Two coats pretty much assures 100% coverage. Hope that helps! What are your thoughts on using 5/8 fire rated drywall on the outside? Goods, bads? Can you sand a part instead of sandblasting it? I’m powder coating small solid brass objects. They typically come with a factory coating of I assume lacquer. Our coating company typically rubs them down with acetone and then prebake them for 25 minutes. We had not experienced chipping until recently. We are purchasing new powder as it was significant issue with one color. We don’t want to sand blast as it gives an orange peel finish and bead blasting while an option is a bit costly and maybe? Not necessary. Any thoughts? We are going to start to test a new protocol of letting the brass parts sit in acetone for a few hours and then boil on water. Seems excessive but we want to get the best adhesion possible without blasting? Any other process you might suggest we try? Appreciate all the info you have put on this site. One question - reading the above prep process its saying to sandblast / apply zinc phosphate coating and then clean with denatured alcohol...the zinc phosphate prep product I have (KBS rust blast) leaves a light powdery zinc phosphate coating that I'm thinking will get scrubbed off if I clean the part afterwards. Is the zinc phosphate you use like a paint?